This is something from an older Rundschau. Though the drafting is basically equal to the regular method, they applied some changes to make it more "British". Again, the armhole tends to be rather deep. This remains so when you apply the direct measurements. It's caused by the higher shoulders. To be honest I'd say that this is the better draft when it comes to clear and clean lines and a good fit. I'd say it is less the shape of the waist and more the fullness of the chest that the front dart was created. You can take out much more width with the side seams. The problem with the front dart starts when it becomes to "deep", i.e. they take out too much material. The difference in shape of front and side panel becomes more prominent and causes those severe distortions (indicated by the dark green arrow) that I find unsightly. Abb. 6 to 8 show how to check if the darting (Süssonierung) is done well. Abb. 6 shows how the rear armhole is pulled away from the front. Abb. 7 shows that extra, unwanted length when you put the armhole in it's natural and correct position. Abb. 8: That extra length pinned away. You have to let out the front dart and sometimes even the side seam, plus you have to make the side panel more straight (taking away a bit in the front and let it out in the back) to get a good shape. Almost any coat made using that regular RS style draft shows such distortions, no matter what size. 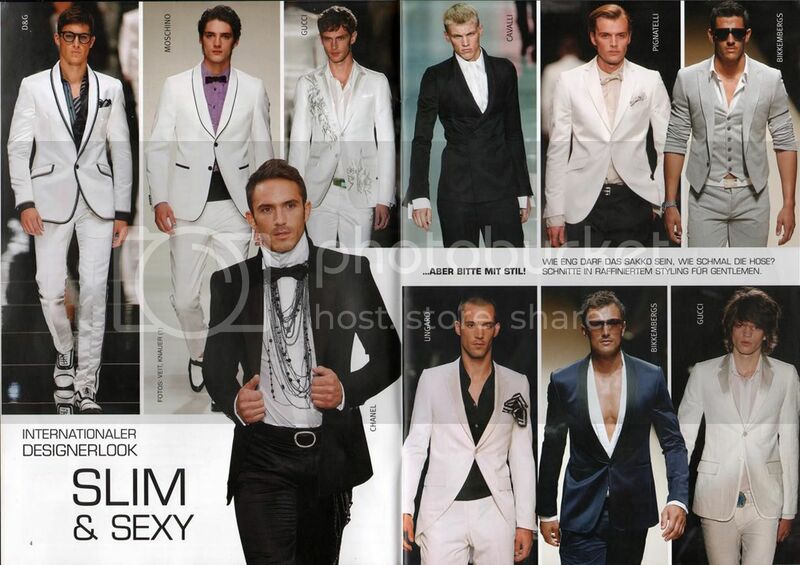 From what I have seen, coats based on italian drafts (like Brioni and maybe Samuelsohn also) don't show them. Unless the wearer insists on wearing a size he had 20 years back. Until the eighties the Rundschau draft had all the necessary qualities to provide a good fit. I enjoyed looking at the fitting and alteration scans you posted. What book are they from? One of the things I noticed in those scans were the shoulder pads- they seem quite thick to me- but maybe that's because I am ussed to cutting more "period" garments and the designers are always asking for less padding. This question may really be for a new thread, but what is the standard thickness of shoulder pads that you use for an average figure/average shoulder slope in an average modern draft? The scans are taken from Rundschau magazines published in the late 50's, I think. Back then they showed all sorts of stuff which was strictly related to bespoke tailoring. Today they have more articles related to RTW and industrial production. Most of the bespoke tailors are gone, so they had to find a new clientèle. As for the shoulder pads: If you look closely the thicker part of the pad is in the back, filling out the hollow area. A normal addition for pads would be 1cm, but I've seen coats with really flat pads lately. I think it basically depends on the style of the coat/ shoulder. I love those things, what a pleasure for me. Be aware, when you draw the Sakkogrundschnitt, the arm scye is 1.5 cm to wide, they stole the wide from the chest girth which is to samll. Schneidergott mentioned already. I was checking the pattern in order to steal knowledge from Mueller Muenchen. A good Tailor always should look where he can find improvements. The construction of the backneck is 0.5cm to wide (zu Halsfern, they like it, its a new Mueller style probably). Mueller did this trick to move the shoulder for their favorite 2cm to the left and to fit the Shoulder lenght over the back width. When Mueller took out the side seams, their back width got to wide in the construction but they still consist of the 2 cm. I am very sure the Tailors are smart enough to not follow patterns blind and figured it out. Tailors and cutters, maybe, since they take direct measurements. But your diagnosis is pretty much applicable to all RTW and MTM coats based on recent Müller&Sohn, so I'd say that most clothing designers/ -engineers do not know better. 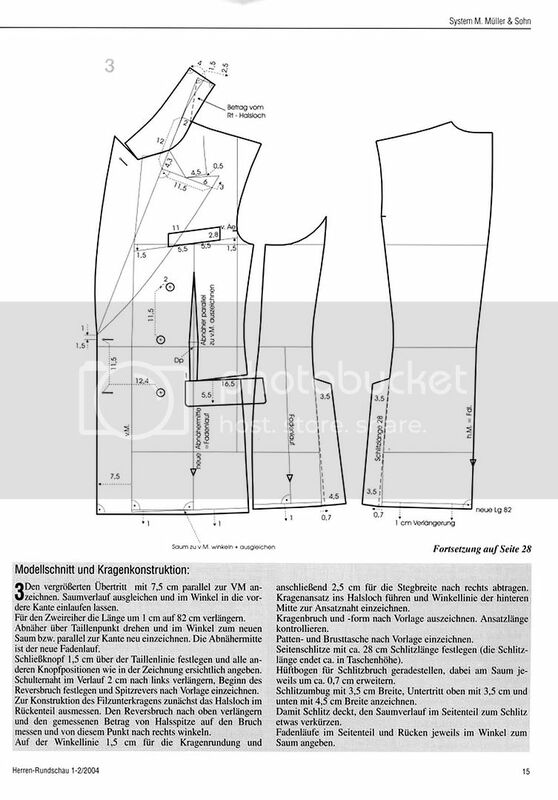 While the basic size RTW pattern could still work, the whole thing gets worse with every alteration of it. Plus they cut a weird scye shape, which does not follow the curves of the body. Which effects the shape of the under sleeve, which effects mobility. Nice looking coat unless you move your arms. And yet most people don not notice or care about it, that is, until they have worn a better one. But where to find that? Except for the high end Italian makers and coats based on jefferyd's work almost all coats seem to be based on Müller&Sohn patterns. The other way would be to cut extra length onto the under and upper sleeve to give more length where needed. But that might create some ugly bulging. For the neckhole exists a workaround, which you can find here! In the second picture you can see how you could take a precise measurement of the rear neck hole. Which effects the shape of the under sleeve, which effects mobility. Nice looking coat unless you move your arms. I get the feeling that somewhere along the line the Rundschau system stopped being a bespoke drafting system and became a RTW drafting system. Some may say that that it doesn't matter that a coat distorts when you move because most people don't wear riding habits and commute to work on horseback, conduct traffic or orchestras etc. However, these sorts of coats distort when you place your arms on the table at a board meeting, eat with a table, drive a car, or raise your glass for a toast. If you look at old films even as recently as the 1960s it is very noticeable that when a fist fight breaks out they keep their coats on. These days, it is common practice to remove one's coat when dining at a fine restaurant - something that would have been considered akin to taking ones trouser's off once upon a time. Why? Because people feel restricted in their coats for one thing. You can barely raise the soup spoon to your lips without the coat twisting awkwardly. A lot of modern tailored garments had their origins in utility garment making for horse riding, shooting etc all of which demanded that the garment be cleanly fitted without restricting any movements. It's an ideal that we should remember. Note that one of their solutions is to extend the front dart to the base of the skirt. I don't see why you couldn't do this in addition to having an underarm body. These days, it is common practice to remove one's coat when dining at a fine restaurant - something that would have been considered akin to taking ones trouser's off once upon a time. Why? Because people feel restricted in their coats for one thing. You can barely raise the soup spoon to your lips without the coat twisting awkwardly. These characteristics sound a lot like a stooping figure, perhaps this is what the draft was inadvertently meant for? I think the Rundschau pattern we have in (world) wide use now is from the late 70's and has slowly been transformed into the easy to deal with by computer systems pattern we have today. BTW I think that the version that I have pinned in this forum comes from the early 1960s. It's hard to tell because editions of der Zuschnitt don't carry a publication date. The 1966 version that I have also included seems fairly similar except for some minor stylistic changes. I must try to see what I can dig out of my early 1970s editions of Rundschau. Schneidergott, I did not know it’s that worst... I was only imagine it. When I saw the armhole shape, I think this sick. The back misses a part in the underarm and the front looks like a square. This is worst! The armhole skye is definitively to deep. You cannot lift the arm without moving the whole thing up to the sky. I was looking in my Mueller book 15. Auflage, they have started already a little bit of playing with the armhole in the underarm, its a tiny bit to round already there. But this can be drafting mistakes. People have no clue what a suit has to be, cause they have no money to spent for the Tailor. 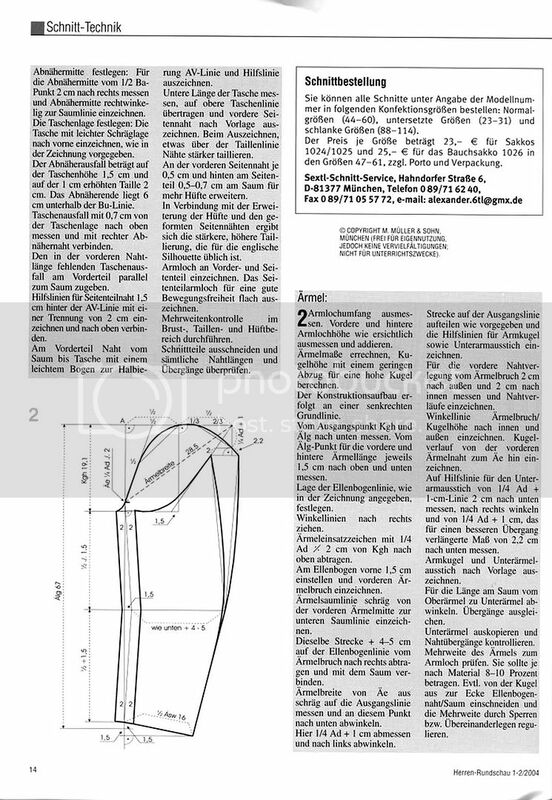 There people who publish those patterns in Rundschau they are messed up in their thinking they think this is like it has to be. I was looking at the fashion picture cause I was wondering why they stole 1cm from the chest and put it in the armhole and indeed those coats look like 'Panzer' The front has 'Lockerung' of 1.5cm, the armhole looks like eine 'Muelltonne'. 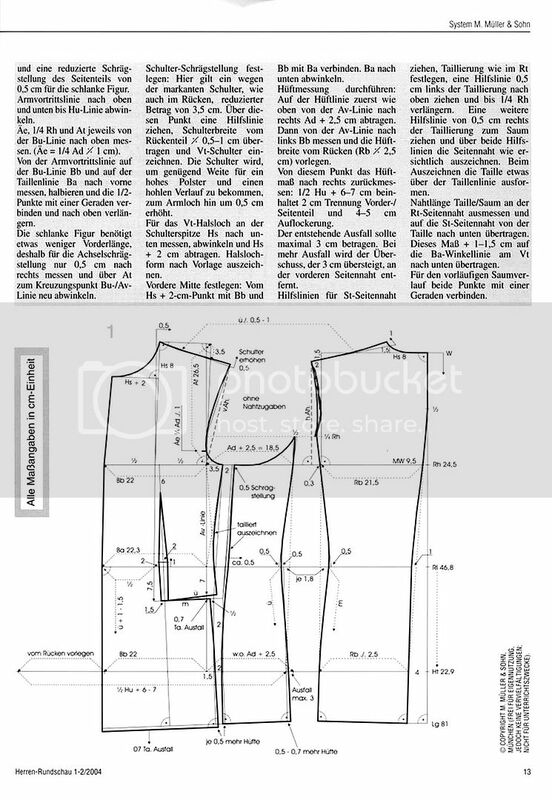 Tailors in Germany dont do that, they know something is wrong with Rundschau patterns. The industry knows nothing, they use computer drafting programs with messed up shapes. Probably Masskonfektion somewhere produced in eastern countries, they dont care. The poor man who has to alter it has to suffer, there is nothing he can do, keine Einschlaege and everything messed up around that armhole. I would be dispaired. The alterator only can adjust widths and lengths. It's not an Italian thing to make good armholes. The good tailors don’t go with Rundschausystems, they have the Mueller book from 1955-60 and work with this. This is common sense not to draft eine Muelltonne in the armhole and produce a Panzer in the front with 1.5cm Lockerung there, how nasty this looks like. Edited by Der Zuschneider, 06 December 2009 - 03:41 AM. The poor man who has to alter it has to suffer, there is nothing he can do, keine Einschlaege (inlays) and everything messed up around that armhole. I would be despaired. The alterator only can adjust widths and lengths. That is ever so true! I do suffer, hard and every day! Very exhausting! The funny part is that when you move the side panel to a straighter position the coat looses most of the distortions under the armholes. You don't have to look for MTM made in Asia to get messed up armholes. They use what European companies use, so chances are there are no differences. 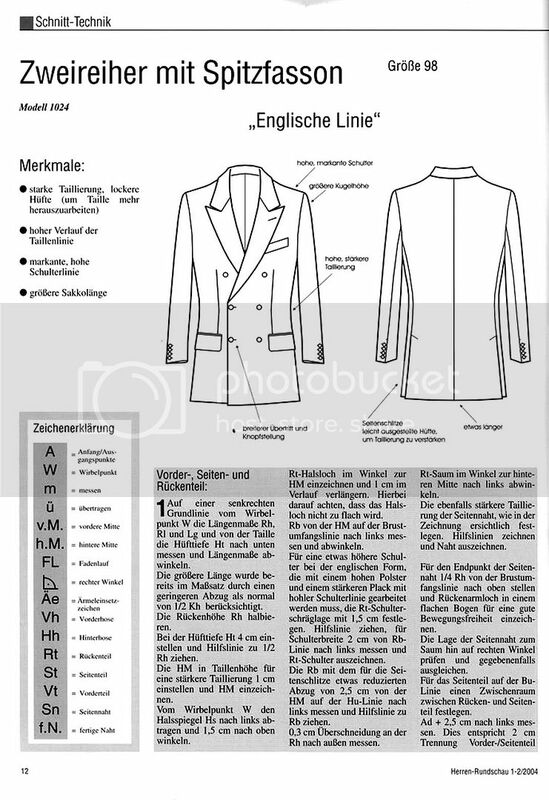 The problem I see is that many of so called "Bekleidungsingenieure" (clothing engineers) and designers have no real experience of tailoring, they just repeat what they are taught! I guess the latest draft has become this way to allow for easier grading. But with each step in size flaws become bigger and will have a stronger negative effect on the fit. The computer systems are a compromise of what is useful and good and what is technically possible. Problem is, most tailors don't know about computing and the computer nerds don't know about tailoring/ pattern making! So this is probably the best we can get. And yet a good CAD operator should be able to adjust the pattern and minimise those flaws. A good one seems to be hard to find, though. The main difference though, is the wider armhole diameter in the new calculation. But with both calculations you get a relatively deep armhole already. I am 185cm tall with a 110cm chest, so the scye depth should be around 25cm, which means it would be about 6-7cm deeper than the one measured on the body. So my advice would be to draft a proportionate pattern using the direct measurement of the back height (taken around the chest passing just under the armpits). Make sure to wear a tighter shirt with small high armholes and a slender sleeve.